We love this salad and have made it multiple times in the past six weeks. The flavors are subtle, clean and spectacular! This is one of the absolute best ways to cook beans Ever! And soaking them for two days really helped on the gas – Thanks for that tip Patty! The added bonus is that it’s Heart Health Month – Be good to yourself! 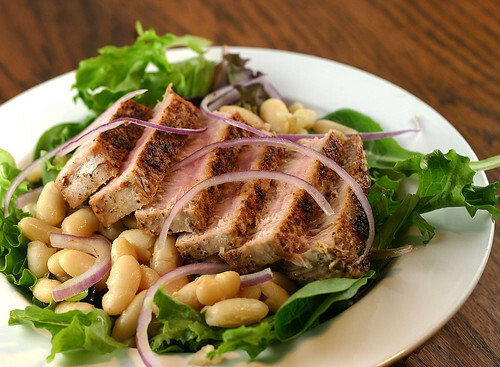 Soak a pound of dry cannellini (white) beans for two days – rinsing at least once each day and refilling with fresh water. Simmer until cooked all the way through about 45 minutes to an hour. 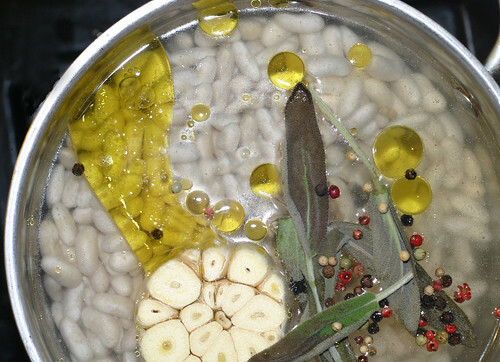 Drain – SAVE the broth, but pick out the sage and garlic. The peppercorns are fine to leave in. You can peel the garlic and use it or just toss. This looks so pretty for being so simple. You need to teach people how to properly cook tuna. It seems like I see it made wrong all the time. I don’t know about soaking them to help with the gas. They’re gassy enough already.